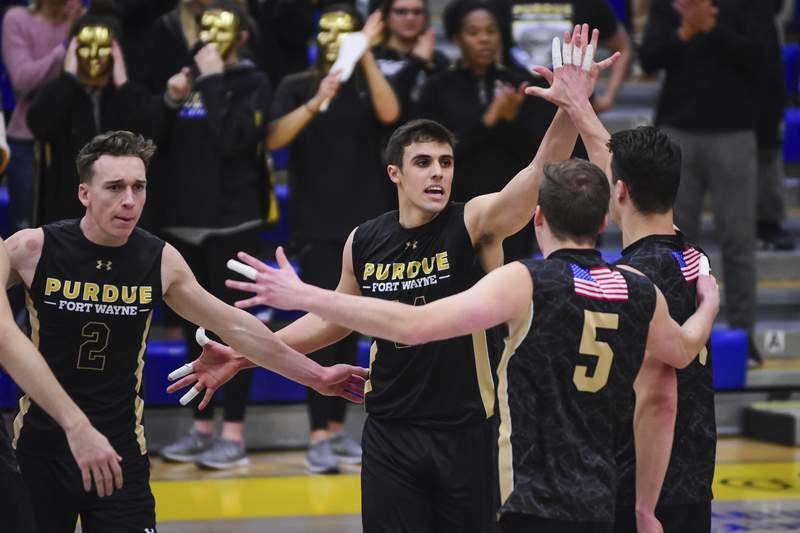 Mike Moore | The Journal Gazette Purdue Fort Wayne outside hitter Pelegrin Vargas, center, was named to the All-MIVA first team for the second straight season. Pelegrin Vargas and Diego Negron have always been rivals. The Purdue Fort Wayne and Lindenwood volleyball players have known each other since middle school, went to rival high schools in Puerto Rico and now find themselves battling again with the season on the line. With its best Midwestern Intercollegiate Volleyball Association regular season since 2007, No. 3 seed PFW (16-11, 8-6 MIVA) scored homecourt advantage and plays host to No. 6 Lindenwood (9-18, 5-9 MIVA) today in the MIVA quarterfinals. The friends put on a show March 20 in the Mastodons' second win over Lindenwood this season. After PFW swept Lindenwood in three sets in the first meeting of the season March 3, and Negron played for just minutes in one set, his role increased in the second meeting – and Perrotte said that made all the difference. Vargas, an outside hitter who just won his second consecutive All-MIVA first-team selection, has been the most prolific MIVA hitter this season. Leading the conference in kills with 386, Vargas carried Mastodons. But towards the second half of the season, opposite hitter Alex Dickmann has stepped up, freeing up Vargas to do even more damage. Dickmann, a senior, said he's happy to balance the floor and take advantage of team's giving all their attention to Vargas. “Of course Pele being the All-American that he is he gets a lot of team's attentions, so it kind of frees me up on the backside,” Dickmann said. Dickmann has averaged 18.6 kills in the last three matches. It's been four years since the Mastodons have played host to a quarterfinal matchup, and despite ending the season on a two-match skid, dropping the last two in five sets to Ohio State and McKendree, Dickmann is confident his team has learned from prior miscues. “It hurts a little bit, but you have to move on from the matches and learn from them and we know that we can't take teams lightly,” he said. “Win or go home and we plan on staying in it,” Vargas said. Note: Senior setter Michael Keegan was named to All-MIVA first team and junior middle blocker Richie Diedrich to the second team.